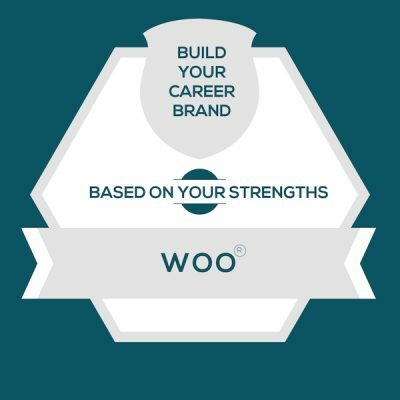 I constantly get questions about how to align your CliftonStrengths talent theme of Woo with your career. So in this series, I break down one strength per episode — so that you can add to the insights from your StrengthsFinder report and make a better match between your job and your strengths. Today, the talent theme of the episode is Woo. Now, what’s missing in most of them is “the how,” and this is where your StrengthsFinder talent themes live. This is an overlooked use for tools like LinkedIn, which is not just for job seekers. I bet you are just like most of my StrengthsFinder training clients, where you don’t see your teammates and customers every day. That’s why LinkedIn has become so important for career branding – because it’s how your teammates, customers, and vendors go look you up before a meeting – to see who they’re about to talk to. And rather than only telling them what you know, you should also give them a peek at how it is to work with you. So here are a bunch of adjectives you can use in your career branding and your LinkedIn profile to represent the Woo talent theme. These are the cultures, interactions, or situations that feel like soul-sucking drudgery to someone with the talent theme of Woo. They might even make you want to quit the team. So I’ll give you a couple of these to be on watch for — because if they fester, you might get the urge to quit the job or become detached at work. Weeks in isolation where you don’t get social interaction — if you lead through Woo and you work from home, be sure to “get your people fix” through video calls with colleagues or by getting out of the house for social hour. The need to continually deliver bad news or work with irate customers — if you lead through Woo, you’re usually watching for a positive reception from that person. If you’re in many interactions per day where people don’t like you or your answers, it will be extremely draining. These are ways to apply the talent theme of Woo at work, even when the job duties on the team feel pretty locked in. If you’re reading this as a team manager, be sure to have a conversation around these ideas. You’ll both be able to come up with places to apply them. Onboarding New Hires: Consider how this person could play a role in onboarding new team members or customers. They will likely enjoy the opportunity to create a welcoming experience. Making Strangers Feel Comfortable: Talk about responsibilities that include meeting a lot of new people — anything from software demos to creating a destination booth at a trade show to delivering presentations or doing customer tours. Emcee or Experience-Creator: If you have annual events, like holiday parties or customer appreciation events, see if your team members with Woo would love to Emcee them or be part of designing a magical experience. Keep in mind that there’s a lot of behind-the-scenes work with big events. Someone with the talent of Woo is usually more energized by the front-of-house type of responsibilities. LinkedIn: Go take action on your LinkedIn profile with the career branding section. Challenge yourself to write one sentence in the Summary section of LinkedIn that captures how you collaborate as a teammate at work. Audit For Red Flags: Think over the 2 red flags to see if there’s anything you need to get in front of before it brings you down. Offer Your Talents To The Team: Finally, volunteer your talents through the application ideas. And if you’re a manager, have a conversation with your team members about which of these things sound like something they’d love to have more of.